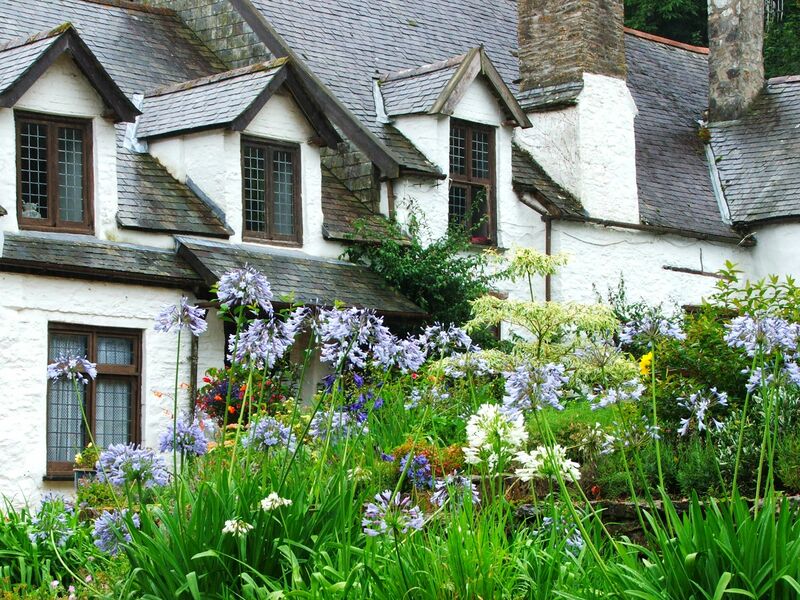 Chambercombe Manor is nestled in the leafy Devon countryside not far from Ilfracombe. It’s charming whitewashed walls and doorways embraced by climbing plants hide a building with nearly a thousand years of history. In other words, there has been an awful lot of time for strange phenomena to seep into the wood-work, accumulate in dark corners and permeate the very fabric of the building. To say Chambercombe Manor is haunted is an understatement – it is considered one of the most haunted houses in Britain. Originally it was the home of the Champernon family, but it is now owned by The Chambercombe Manor Trust. I visited the manor in 2010 in what must have been one of the wettest summers ever (and for England – that is saying something!) and took one of the Trusts very entertaining tours. 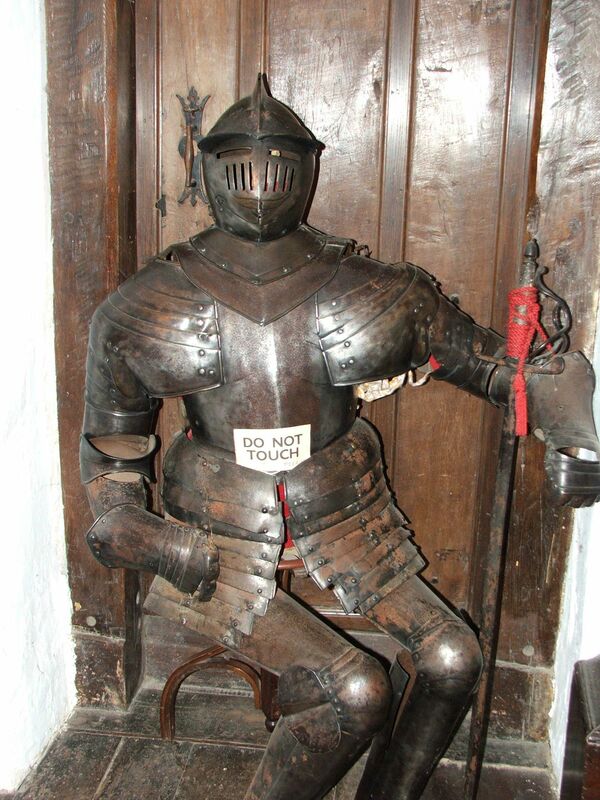 Unlike many properties open to the public in this house you can actually sit on the sinister seventeenth century chairs and (within reason) touch things! The guide was really unconventional and explored the origins of many popular sayings with the aid of the furnishings (The turning of the tables, Sleep tight etc). She also focused on the supernatural happenings in the house and told the chilling tale of the secret chamber and its grisly contents. The most famous story associated with Chambercombe was unearthed in 1738 (or maybe it was 1865 – the sources seem to be hazy on this point) when a tenant was fixing the roof and noticed a window that he could not account for. Intrigued, it was his wife who finally located a lost room by knocking on the walls until she heard a difference in the sound. 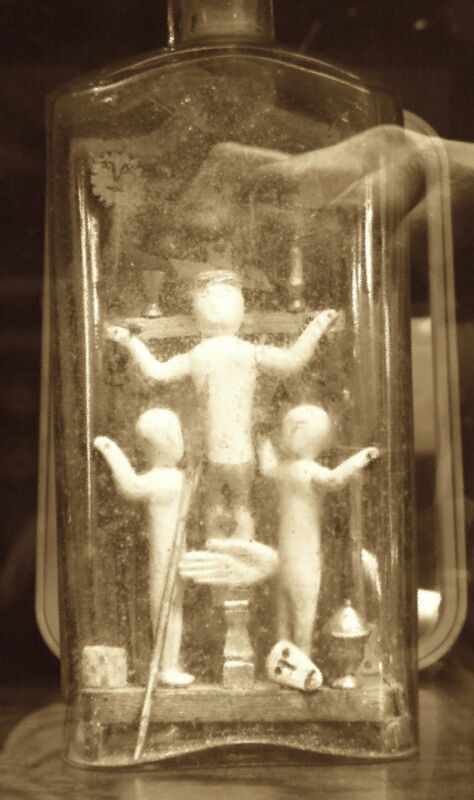 When the chamber was opened up, amidst the dust and cobwebs they found a four-poster bed, and upon the bed lay the skeletal remains of a woman. 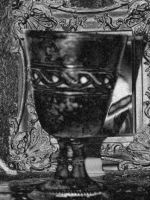 We entered the haunted chamber and settled down on the ancient oak chairs and iron-bound chests as the guide elaborated on the tragic tale. I was lucky enough to grab a gorgeous carved oak chair (the one by the doorway in the picture) and my friend Bonnie was standing with her back to the door to the secret chamber. The guide explained that Local legend says that the unfortunate woman was a rich lady visiting relatives at Chambercombe, but was shipwrecked and injured. She was brought to the manor to recover but did not survive her ordeal. The good will of her rescuers seems to have departed with the life of the lady, and as she was wearing very fine jewels, they decided to steal them and hide the body. To conceal their crime the body was bricked up in the room abutting the chamber in which we sat. Perhaps the inhabitants of the manor were engaged as Wreckers – luring ships to their doom on the rocky shores of the Devon Coast – perhaps not. Whatever the truth of the tale, the story was gripping, so gripping in fact that at one point Bonnie even pitched forward as though to hear better. 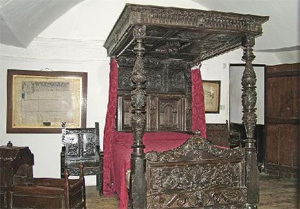 The guide also explained how the Most Haunted crew visited Chambercombe and in the dead of night filmed the cradle (seen in the picture) apparently rocking of its own accord. This elicited some squeals from a mother and daughter team of hysterics (who had seen that particular episode) because they were convinced that they had just the cradle rocking. As we left the room Bonnie turned to me and said ‘I think the man behind me pushed me the t*** – it really hurt’ – but I had been sitting just behind where she stood and nobody was really near her and nobody – that I could see at least – pushed her. She rolled up her sleeve and there was a fresh bruise forming on her arm. Interesting. My own experience at Chambercombe was a much more benign one. 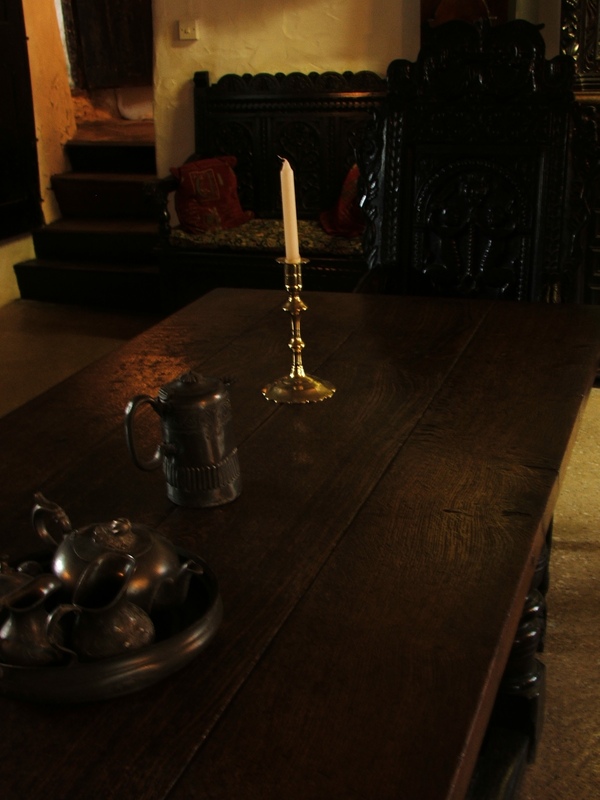 Much of the manor is filled with beautiful but heavy and dark oak furniture from the sixteenth and seventeenth century, which lends a gloomy air to many of the rooms. However one of the upstairs bedrooms was a lovely light airy room. As soon as I entered the room I just wanted to laugh, it had such a jolly feeling to it. More than that, I spied a large Georgian bureau or cabinet affair, with hanging medallion handles. I was overcome with the impulse to turn them all upside over. As my hand snaked towards the cabinet the guide began to talk. She explained that the room was supposed to be haunted by laughing and mischievous children, and that one of their tricks was to upturn the handles on the cabinet! Sweet! I have a rational explanation for my experience, involving a childhood obsession I had with upturning the handles on my grandpa’s old oak sideboard, but I’d like to think that this experience was something a little more unworldly! There are many more tales about Chambercombe its history and its spectral inhabitants you may want to experience it for yourself….its a unique and very eccentric house. Reading your posts always makes me wish I could spend more time in the UK. For all my time in Ireland, I’ve only been to England once, which is really a shame. Chambercombe looks beautiful, and I’d love to take that tour. 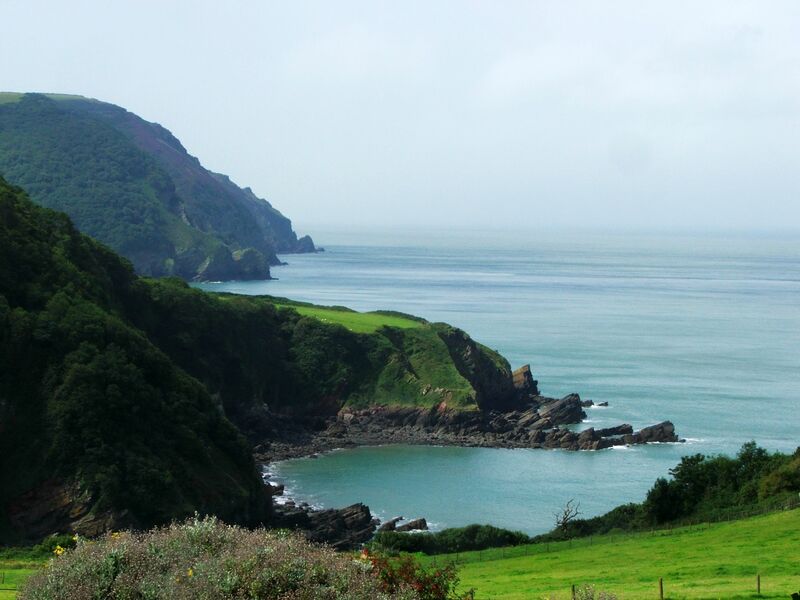 Also, wow, that shot of the Devon coast is gorgeous. Aw, really makes me want to travel there sometime. A friend of mine is applying for a research job in the UK–I may try to abuse our friendship and get a trip out of it. You should – I always do when my friends move overseas!